“RNIB’s Finding your feet, in my opinion, is essential for all visually impaired people. It has changed my life!" Says Ken Carson after completing one of Our ‘Finding Your feet’ programmes in 2015. There’s no question, life can be difficult if you are losing or have lost your sight. Our ‘Finding Your Feet’ course can help you take positive steps forward to face some of the challenges that sight loss brings. The programme is for anyone over 18, who has recently been diagnosed with sight loss or whose circumstances have changed and they now find themselves struggling with some of the challenges of living with sight loss. Bring a spouse, partner, or friend as we recognise that sight loss can impact on other members of family and close friends too. Don’t worry if you come on your own, Finding Your Feet is a group programme and you will be in the welcoming and supportive company of like-minded people. Finding Your Feet has given me lots of information and the confidence to take control of my life. For this I cannot thank you enough . What happens at Finding Your Feet? The programme is usually a three day residential hosted by a local hotel. Our friendly and expert facilitators host a number of interactive workshops covering: mobility, useful products, social activities, and accessible technology - to name a few. Sessions are informal and take place in a relaxed, fun atmosphere. We make sure that there is also some free time to meet and talk with the other members of the group, to share experiences or simply take time out to rest and relax. 17 to 19 October 2017 at La Mon Hotel, Belfast. 6 to 8 November 2017 at The Hilton Hotel, Templepatrick. These two programmes are delivered as part of the Looking Forward project and funded by the Big Lottery Fund Northern Ireland. Both residential programmes are for anyone aged over 60 and recently diagnosed with sight loss or whose circumstances have changed and they now find themselves struggling with some of the challenges of living with sight loss. Our interactive workshops are aimed at helping you to identify your needs, overcome any challenges you may face in day to day life. Finding ourselves- Getting to know each other – a chance to meet and share thoughts with others who have sight loss. Finding out how to make the most of your sight - Exploring low vision aids, colour contrasting and lighting. Finding solutions - Sharing ideas, tips and finding new ways to tackle everyday living. Finding your way - Getting out and about with confidence and ease. Finding fun - Finding out what is available to help you access hobbies and interests. Finding the money - Accessing the benefits and concessions that you are entitled to. 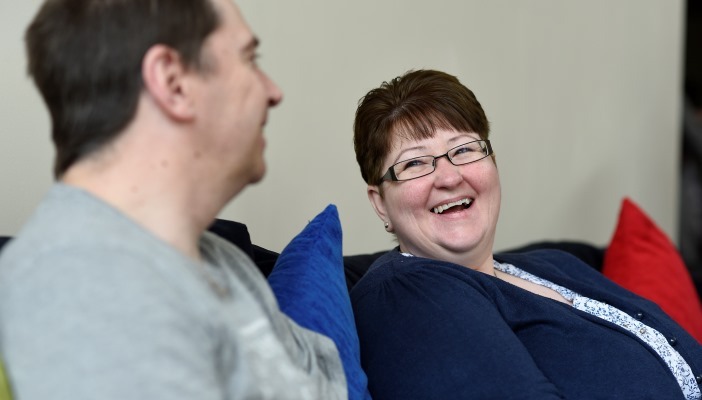 Finding the right words - Exploring the emotional impact of sight loss on you and your family. Finding the way forward - Identifying networks of support and taking steps to move on. Finding out your views - A chance to give feedback to enable us to develop and improve the programme.